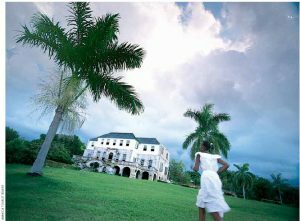 Rose Hall is the most famous great house on Jamaica. The subject of at least a dozen Gothic novels, it was immortalized in the H.G. de Lisser book, White Witch of Rose Hall. A visit to Jamaica is an experience in which history and all your senses will converge to give you a lifetime of memories. Jamaica is unique, with its gifts to the world including reggae and dancehall music, fine rum, exquisite coffee and jerk seasoning. I am touched by the many Canadians who speak highly of their experiences in Jamaica and of their desire to return. Like them, you can take an unforgettable voyage through alluring sunscapes with lush mountain backdrops. You’ll meet friendly people and discover spicy flavours and island beats, all of which make my country, Jamaica, the vibrant heart of the Caribbean and one of the top destinations for Canadian travellers. Take a horseback ride through the water at ChukkaHorseback Ride ‘n’ Swim in St. Ann. My annual pilgrimage home is a constant reminder of the natural beauty of the island and an opportunity to immerse myself in the culture. It is a refresher course on the many attractions, adventures and sporting activities that are offered and I am pleasantly surprised each time at the new ones introduced. Snorkeling tours, boat trips, scuba diving, plantation tours, beautiful parks and breath-taking waterfalls are all enjoyed by visitors and are all in close proximity to major hotel areas. My enduring favourite is Jamaica’s world-renowned attraction, Dunn’s River Falls, just outside Ocho Rios, where people of all ages can climb the 600 feet (183 metres) of cascading waterfall. Only last summer I had a chance to re-live the feeling of cool water bathing my feet and of soaking in the myriad pools along the route of the climb. The exhilaration of getting to the top is worth all the effort. 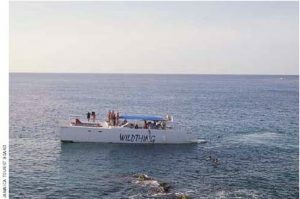 Take a catamaran cruise in Negril. Next door to the Falls is one of Jamaica’s newest attractions, Mystic Mountains, a trilogy of activities — canopy ride, bobsled and zipline — which my children enjoyed as much as I did, age not being a deterrent to great fun. Around the corner from Dunn’s River, check one off the bucket list at Dolphin Cove where you can swim with dolphins and stingrays. Some of the most popular experiences on the island are available through Chukka Caribbean Adventures. In addition to the new Zipline Canopy, other popular tours include horseback riding, river tubing and 4×4 Jeep safari tours. Blue Mountain Bicycle Tours allow visitors to ride downhill while taking in the spectacular mountain scenery. A visit to Jamaica is just not complete without sampling some island rum. Rafting on the Martha Brae in Montego Bay or the Rio Grande in Port Antonio is a signature vacation treat for visitors. For history lovers like me, you will learn that the rides date back to the 1950s when actor Errol Flynn noticed banana farmers strapping harvests to bamboo rafts and floating them down the river. Flynn set up the first rafting outfit, offering an afternoon of luxury and natural tropical beauty to guests. The Rio Grande journey lasts nearly two-and-a-half hours and winds through rainforests and farmland on a 30-foot (9-metre) raft expertly steered by a local “captain.” Along the way, you may stop for a quick swim, a rum punch or a chat with locals. What better way to spend a part of your day? Mystic Mountain’s bobsled ride is worth a try if you’re in Ocho Rios. I had the great joy of visiting the island’s recently opened Falmouth Cruise Port in the historic City of Falmouth, with its Georgian architecture. The 32-acre (13- hectare) two-berth port accommodates the Royal Caribbean’s Oasis of the Seas, the world’s largest cruise ship. Cruise passengers have access to more than 60 attractions in the surrounding area of Falmouth and in nearby Ocho Rios and Montego Bay. No family vacation of ours is complete without a chance for my husband to play at one of the 12 challenging and scenic golf courses that attract players from around the world. In fact, Jamaica lays claim to the oldest course in the western hemisphere: the Duke of Manchester opened Mandeville Golf Club in 1865 (now Manchester Club). And they are still playing the original layout, although in a different order. My golfer husband will attest to the joy of playing at courses in Montego Bay, Constant Spring, Caymanas and Negril Hills. In Jamaica, you’ll find luxurious resorts, secluded hideaways and tropical scenery — the perfect setting for tying the knot. You will forgive my understandable subjectivity when I say that there is no sunset like that in Negril. Wherever you go in Jamaica, you’ll find luxurious resorts, secluded hideaways and the Caribbean’s most tropical scenery — the perfect setting for tying the knot, retreating post-nuptials or re-living memories. Romance is woven into the very fibre of Jamaica and the island promises to woo your imagination, capture your hearts and set the stage for making new memories. The richest Jamaican cultural experience is in the food and drink we enjoy. Our culinary history is intriguing, too. To conceal their whereabouts, the Maroons (African slaves who escaped to the mountains during the British occupation of Jamaica) devised “jerking,” a method of spicing and cooking pork underground so that smoke would not be seen. Today, jerk pork, jerk chicken and jerk fish abound. To feed slaves cheaply in the 1600s, the ackee fruit was brought from Africa, as were a variety of yams, roots, vegetables and the breadfruit. To preserve meat and fish, spices and pepper were added, and unique seasonings, like the famous “Pickapeppa” sauce, were created. Cassava, a root tuber, was cultivated by the Taíno people and is used today to make “bammie,” a flat, toasted wafer eaten with fried fish. Another traditional bread, “festival,” is frequently served with jerk. The national dish of Jamaica is ackee (a creamy fruit), and salt fish (which originally came from Canada). 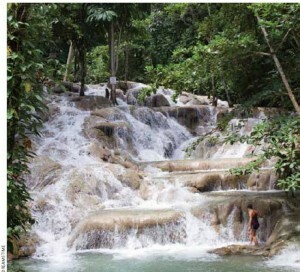 Dunn’s River Falls is a popular spot for tourists who like to climb the falls. Indian and Chinese influences have made curries and chow meins part of the national menu. Mangoes, pineapples, papayas and bananas abound and otaheite apples and soursop (a tangy fruit with the flavour of strawberries and pineapple) combine in desserts such as “matrimony,” a fruit salad bound with condensed milk. Of course, a visit to Jamaica would not be complete without savouring Blue Mountain coffee or some island rum. 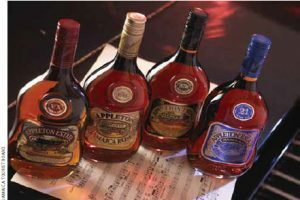 One of the most identifiable products associated with Jamaica is Appleton Rum. Its birthplace, the Appleton Estate in St. Elizabeth, was founded in 1749 and is the oldest sugar estate and distillery in Jamaica. A tour of the Appleton Estate on the South Coast allows you to experience the history of rum and provides an intimate look at the creation of one of the most celebrated spirits in the world. Blue Mountain Coffee is considered by many connoisseurs to be the best. Coffee is grown on estates at an elevation of 4,000 feet (1,200 metres) on the cool, northern slopes of the Blue Mountains. It is carefully hand-picked, processed and sorted to ensure that only the finest beans containing that full flavour and aroma, so prized by those in the know, are selected. At 7,099 square kilometres (2,740 square miles), Jamaica is the third largest island in the Caribbean. Prehistoric Jamaica was volcanic, and the mountains that soar to 7,400 feet (2,256 metres) are higher than any in the eastern half of North America. These mountains run all through the island’s centre, with a narrow coastal plain on either side. Some 150 rivers, numerous waterfalls and an abundance of trees and flowering plants are found across the island, earning Jamaica the title “Land of Wood and Water.” Here are the highlights. Montego Bay is Jamaica’s charming premier tourist destination and second-largest city. Surrounded by white sand beaches, grand hotels, all-inclusive resorts and charming small hotels and villas, it is renowned for its beauty and range of activities. Negril is located at the western tip of Jamaica, about an hour by car from Montego Bay. The “Capital of Casual,” Negril is a virgin paradise known for its natural beauty, 11-kilometre (6.8-mile) ribbon of white-sand beach flanked by rugged cliffs and free-spirited ambiance. Ocho Rios and Runaway Bay are located in the heart of the north coast region defined by fern-clad cliffs and cascading waterfalls. Known as Jamaica’s “playground,” there is almost an endless variety of activities. The South Coast’s winding roads through tropical forests seem to go on forever in this beautiful, seemingly untouched area known as Jamaica’s “breadbasket,” thanks to great growing conditions. Travellers in search of privacy and solitude will enjoy isolated beaches in this area, where the only footprints are their own. Port Antonio, a quiet port town located 90 kilometres (60 miles) outside of Kingston, is a haven for visitors looking for quiet charm, natural beauty and simple elegance. Its lush surroundings create an intimate respite. Kingston, Jamaica’s capital city, rests at the foot of the Blue Mountains and overlooks the world’s seventh-largest natural harbour. Kingston is the largest English-speaking city south of Miami and is the cultural heartbeat of Jamaica with its pulsating reggae rhythms and rich history. We boast of our attractions but undoubtedly we are most proud to offer you a chance to know the Jamaican people. Warm, friendly and not afraid to engage you, they will freely show you the delights of the island and the charms of unexpected places. I have never known a Jamaican who would not show you how to dance reggae or how to eat roasted corn or yam. The ease with which they welcome you will truly make you feel at home. Of course, we are proud of those who have made Jamaica world famous, among them, Bob Marley and Usain Bolt. The year 2012 is a special one for Jamaica and all Jamaicans. The year marks the 50th anniversary of Jamaica’s independence. It is also the 50th anniversary of diplomatic relations between Jamaica and Canada. Those visiting the island will find it livelier than ever with festivities taking place throughout the year. For events, attractions and accommodations visit the Jamaica Tourist Board’s website at VisitJamaica.com or call 1-800-JAMAICA. Sheila Sealy Monteith is high commissioner to Canada. Reach her at information@jhcottawa.ca or 613-233-9311 ext. 225.